NASA space craft Cassini captures incredible images of the Saturn and its moon, Titan and Enceladus. Pictures of Saturn’s moon, Enceladus shows its surface, peppered with endless fissures, fractures and ridges. Enceladus is unique in a sense that it features more than 100 geysers that are diffused across its south polar region. These geysers eject small icy particles into space. The ejected particles escape the moons gravity and form the ringed planet’s E ring. Cassini also took pictures of another moon of Saturn, Titan. Titan’s surface is covered with lakes of liquid Methane and Ethane. Titan is also one of the Moons in the Solar system which has stable liquids on its surface. 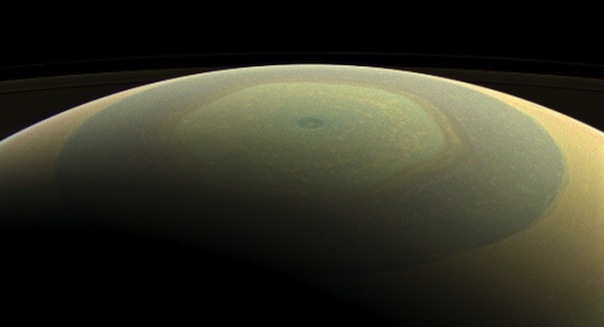 The camera of Cassini was so powerful that it also spotted a rotating high-altitude vortex at Titan’s South Pole. The High Quality image beamed by the Cassini spacecraft which includes Wide angle pictures of the ringed planets North Pole looks stunning. The South Pole was also pictured by the Spacecraft’s cameras and it was all alluring with its stunning blue color. This web site, if it wants to be taken seriously, needs to invest in an editor, training for its writers, and copies of the various standard style guides for journalists. When I started reading this article, within a couple of paragraphs I quit counting the syntax and grammatical and usage errors. Even the word order in places is non-standard English, at first I thought, this has to have been written by a non-native English speaker. Seriously, this is bad, bad writing, as journalism, or, well, English in general. EQUALS, “now we understand why the author in the byline hasn’t bothered filling out any personal information for her ‘About the Author” page”. You may want someone to proofread this article before posting it, because it has a plethora of grammatical issues throughout it.